Save on heating & cooling, increase privacy, and reduce glare! You may think of shades as a design element. Add automation to them, however, and they become a functional and magical element. With the press of a button, you can lower or raise your shades to create the perfect setting for a TV or media room or add privacy anywhere in your home. 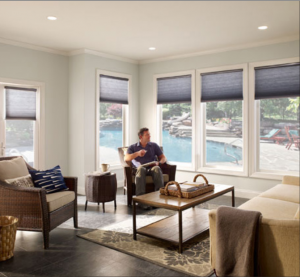 Automated shades are almost a necessity in hard-to-reach windows, such as the foyer, high windows in a great room, or on windows behind a tub. Often, these areas are left bare or the shades are left closed due to the inconvenience of adjusting them. Now, you can easily adjust your shades from anywhere with a simple remote or set them to automatically open and close at specified times of the day. Adjusting shades based on the season can also save on heating and cooling costs. In the summer, you won’t be running the air conditioning in a room that’s warmer due to heat gain. Likewise, you can capture that heat in the winter by closing them at night time or opening them on sunny days to gain natural solar heat. Add privacy at the touch of a button. A must for hard-to-reach locations. Hundreds of styles & fabric choices. Easy remote or fully automatic function. We install virtually any type of shade: Pleated Shades • Horizontal Sheer Blinds • Wood Blinds • Draperies • Kirbe Vertical Drapery System • Roller Shades • Honeycomb Cellular Shades • Tensioned Shades • Blackout Shades (perfect for bedrooms and media rooms) • Privacy and Sheer Shades that cut glare but let you see out • Roller and Honeycomb Shades (available with battery power that lasts at least a year when cycled open and closed twice per day). You can even mix and match, having a wireless shade on the door and wired shades on the windows. 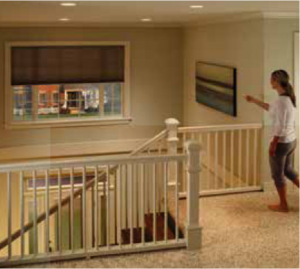 Ask about Smart Shades that automatically open, close or tilt. We also install on high windows in the great room or foyer, saving fine art, furniture and flooring and reducing glare for TV watching. 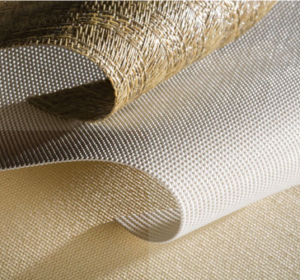 In addition, all of our shades can integrate with Lutron’s lighting control and energy system, making them easy to use and functional. Ask to borrow our fabric selection books or go to lutronfabrics.com for more information. We believe in attention to detail. Our technicians are extremely particular in everything they do. We hide wires, ensure that shades fit your windows perfectly, and respect your finished home. Our shades integrate into your lifestyle so you can open/close them with a button on a wall-mounted keypad, handheld remote or even your smart phone.